The Corn Exchange building was originally known as the Mount Morris Bank Building. 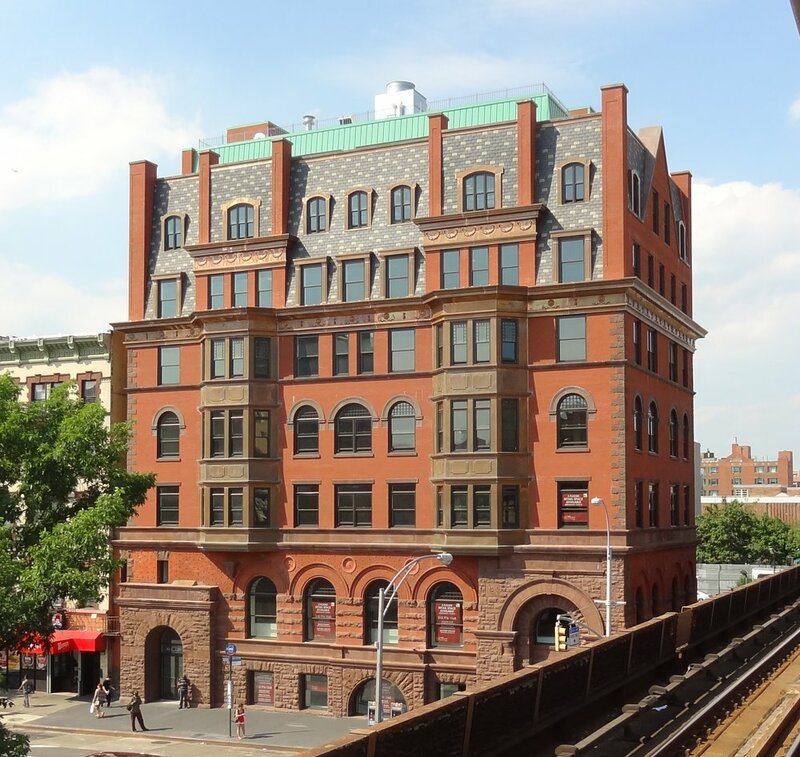 First completed between 1883 and 1884, the building was to be the flagship of its namesake, a bank that was founded in 1880, a time when Harlem was being transformed from a suburb to a denser, urban mixed use neighborhood. 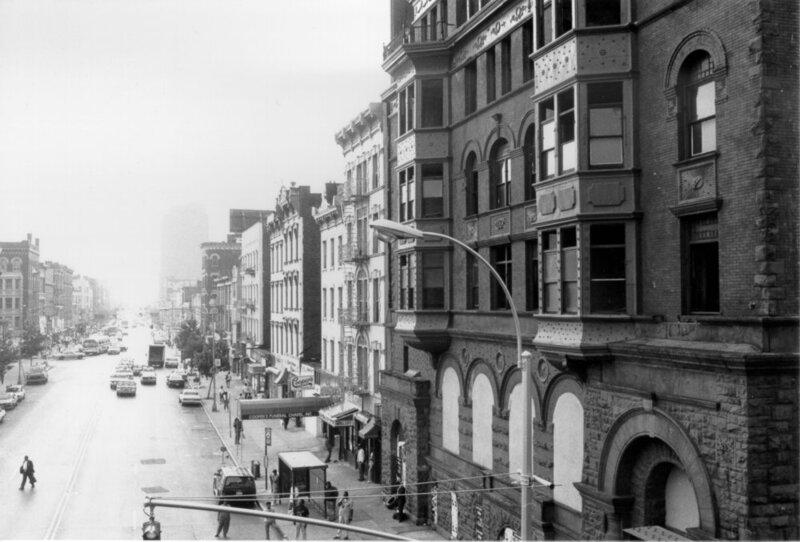 From the beginning, the building led the city’s transformation effort in Harlem by offering a mix of both commercial and residential use. The building was initially occupied by the bank, along with six apartments on four floors above the commercial space. The apartments, charmingly called "The Morris", were later converted into offices. The building was originally designed by architects Lamb & Rich (well known architects of the main buildings at Barnard College and the Pratt Institute), in a unique mix of the Romanesque Revival and Queen Anne styles. The former style was to reflect the sturdiness of the bank while the latter, the more sensitive nature of the residential above. This was characterized through the use of rock-faced sandstone for the base of the bank building, and red Philadelphia brick for the residential portion above. 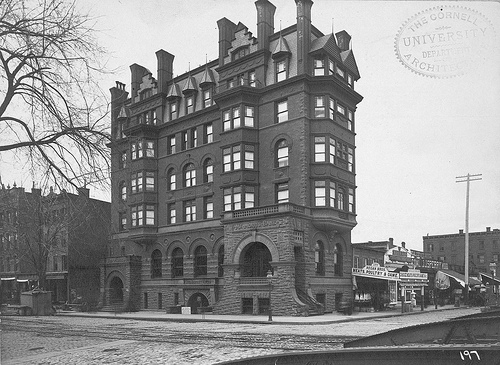 From 1889 to 1890, an addition was added to the building that doubled its size along Park Avenue in an expansion designed by the original architects, In a later renovation, Architect Frank A. Rooke removed the front stoops and stairs, which projected onto the public sidewalk, and rebuilt the entranceways to receive foot traffic directly from the ground level. In 1913 the Mount Morris Bank merged with the Corn Exchange Bank, the first New York City bank to establish local branches. The Corn Exchange Bank then merged with Chemical Bank in 1954 and became the Chemical Corn Exchange Bank. This new entity operated until the mid 1960’s and then moved its operations to a new location nearby following which various commercial tenants and a church occupied the building. Over the next 10 years, poor maintenance and back taxes led the city to take possession of the building in 1972, marking the last that the building would be occupied for the next 3 decades. 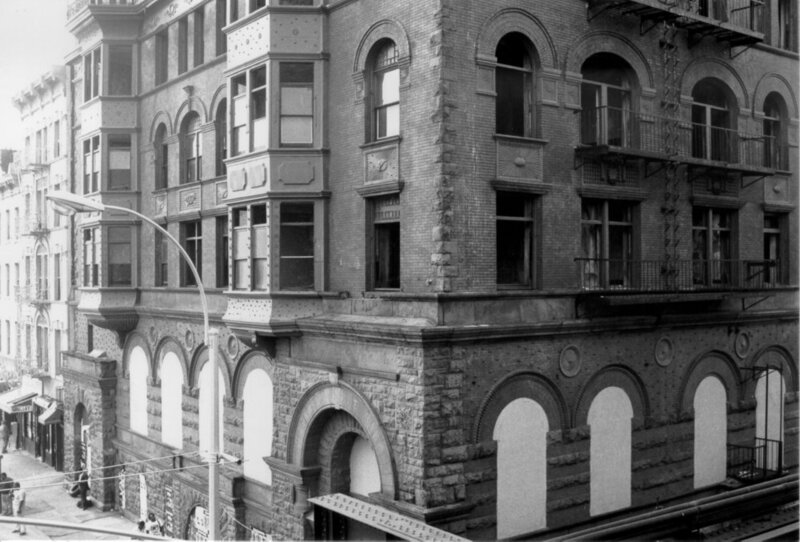 By the late 1970’s, when properties were being abandoned all over the city, the Corn Exchange building remained vacant, Vandalism and deterioration took over quickly and the city was forced to seal the building in 1987. However, in 1989 it was added to the National Register of Historic Places despite its poor conditions, and in 1993, was officiated by the city’s Landmark Preservation Commission. Nevertheless, the now historically designated building still remained in poor conditions despite its landmark status. With the building receiving both national and municipal landmark status, there was hope that it might receive more attention from the city. Instead, the building saw further deterioration over the next few years, finally culminating in a large fire in 1997 which destroyed the roof and the top two floors of the building. In 2003, a local activist purchased the remains of the building for $10,000 in the hopes that it could be turned into a culinary school. However, despite her efforts, she was never able to fully finance her project, and the school never came to fruition. Furthermore, the damage inflicted by the fire left the building structure exposed and unsafe and in 2000, the city once again repossessed the building and in 2009, demolished the remainder of the building until only the ground floor was left. When it seemed like all hope was lost that the building would ever see its former glory again, Artimus, a local developer, purchased the building in 2012 and undertook an enormous three year effort to re-build the structure to its former glory, restoring the historic facade, but upgrading the interior to modern office specifications. Today, the building stands at its exact location, an image of its past benefiting from the technology, services, and amenities of the present. While the majority of the interior and upper half of the building is newly constructed, great effort was made in its construction to reflect the original design. From the red Philadelphia brick to the copper moldings, from the slate roof to the still original sandstone base, the Corn Exchange stands as a shining example of human endeavor, ingenuity, and love for the community. With its rebirth, it is once again positioned at the center of business, commerce and culture in Harlem.